After 9 days of waiting and walking and hoping and threatening to go horseback riding, Luke and I went to bed a little before midnight on Sunday evening, April 26th. I felt a little whoosh down below and realized that my waters had dribbled out. I let Luke know and we decided we would try to sleep to get as much rest for whatever was coming. I had felt a little bit of tightening earlier that day but very mild contractions started coming and more waters came out, so I called Marilee, our midwife, at about 1:30am to let her know. Poor thing who had not slept in her own bed for almost a week because she had been attending other homebirths (3 of which were due after me, thank you very much) had to come and camp out on our couch now. 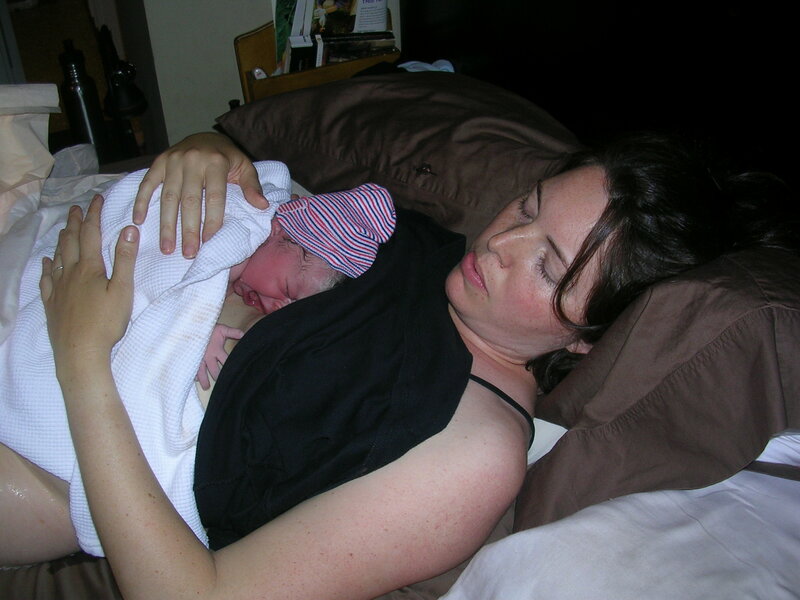 Because John’s birth was much faster than Leah’s, they were treating me as if I could potentially squeeze her out in the blink of an eye, so Marilee and her birth assistant, Liz, arrived at around 2:30am and I woke Luke up to help them find a parking place. They checked to see that baby’s and my vitals were normal, got settled in and we all went back to sleep. I made it a personal goal to work through contractions and try not to wake anyone until 7am. I turned on my little book light to look at my watch every time a contraction came and they were about 10-15 minutes apart (average) but only 30-45 seconds long. The intensity increased by around 5:30am and I managed to snooze here and there until the kids woke up at 6:30am. We all came downstairs in the morning (Monday) to touch base with the ladies and they encouraged us to go about our day, so we had a big breakfast (a croissant sandwich with egg, cheese, and bacon – a personal fave and a delicious part of my pregnancy diet) and Luke and I went for a nice walk while my folks took the kids to the park. Marilee and Liz went to another prenatal nearby and checked back in before lunch. We all realized that baby girl wasn’t going to come that easily, so they packed up most of their stuff and said to call when things were moving along. We had been planning on going to a local Indian food buffet for lunch, so we did and I had about 4 or 5 contractions while we there. We came back home to take an afternoon nap (another regular part of my pregnancy routine) and I slept intermittently but the contractions waned a bit. We woke up, went for another walk and then while I folded a load of laundry I paused to bend over the dryer to work through the contractions. My folks had cooked a big dinner, but I didn’t feel like eating hot food so I had some homemade granola with banana slices and then we put the kids to bed in the guest room with my folks. We went for one more really slow walk at around 8:00pm and then headed up to the bedroom to hunker down for the night. The contractions had become steadily longer and more intense but still not that close together. I was having a hard time finding a comfortable way of managing the pain (no, really?) but ended up leaning up against a tall dresser moving my hips back and forth during the contractions. Then in between each one, I went pee or poop and drank some more water (to continue replacing the amniotic fluid that I was losing). I swear I was peeing more than I was drinking and my friend suggested that maybe I was already losing some of my water weight – interesting thought. As it got later and I felt more tired, I decided it might be better to lay down to try to snooze through contractions. Unfortunately, that caused them to slow down and by 10pm I had a few contractions around 16 minutes apart (ugh!). Luke told me later that some were actually 20 minutes apart – he just (wisely) elected not to share that information with me at that point. I also had a very strange, painful contraction where she moved around a lot and I wondered if she flipped out of position. So I was discouraged and reduced to tears telling Luke that maybe I should just go to the hospital because I couldn’t bear waiting much longer. We decided to call Marilee just to receive some encouragement. I explained all this to her and she said she would come and check the baby’s heart rate and see what position she was in. ETA: about 30 minutes. Now many of you know that one of the signs of transition is wanting to give up. This thought crossed my mind, but it actually discouraged me because I knew there was no way that I could almost be at the pushing stage because I had just had contractions that were TWENTY MINUTES APART. So I thought I was giving up way too early and, similar to Leah’s labor, had just spent a whole lot of time and energy with very little dilation to show for it. Au contraire, mon Frere. As soon as we hung up the phone, Luke suggested that I start laboring standing up again and after the first contraction I started to head to the bathroom for my routine pee and within three steps, I felt another one coming. They came in double peaks one right after the other, my whole body was shaking and in a few minutes I felt her head drop (what felt like 3 inches) into the birth canal and I had to literally spread my legs further apart to make room. Then she dropped again a few minutes later and Luke grabbed my book light to check if he could see her. He diagnosed that I was definitely dilated and then looked longingly out our bedroom window hoping to see Marilee walking up our front steps. Another sign that baby is coming is when laboring mom suddenly declares that she has to poop. Everything is so close together down there that a baby’s head and excrement can be easily confused. Nonetheless, Luke complied and accompanied me to the bathroom where I did this half-squat and then couldn’t commit. Fortunately, Marilee came into the room at this point, but unfortunately, with only her little fetoscope. She took one look at us and said, “Something has changed!” She sent Luke down to the car to get the rest of her bags and equipment and she said he must have sprinted because she was parked far away and he was back lickety-split. (And you thought he was just training all this time for triathlons!) Meanwhile, she coaxed me to the bed and I landed in this weird position between being on my back and right side before the next contraction came. She called her birth assistant and told her that she would not be making it for the birth because “this baby is coming right now,” but would appreciate her help postpartum. In no time at all, she was crowning and I felt the urge to push. At the advice of Ina May Gaskin, I began clitoral stimulation (I know, TMI!) so that blood would flow into the perineum and I would stretch better. (This reduces the likelihood of tearing and it worked – no tears despite her very quick exit!) Luke was watching and encouraging me and Marilee was communicating the position that the baby was in. Her head came out in the second push and the cord was around her neck, so I pushed again, Marilee helped her one arm out and then quickly unwrapped the cord and she was all the way out in the next push. So it was an hour between my emotional low and bringing her up to my chest at 11:04pm (which also happened to be John’s exact time of birth)! She started nursing within the first half hour and has been doing so quite well ever since. 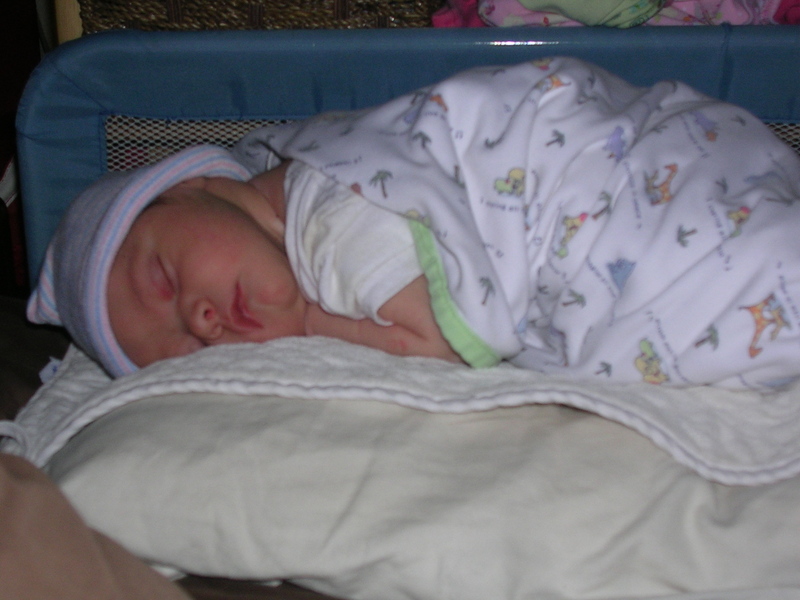 It’s hard to describe the intimacy of birth and even more so the peaceful familiarity of doing it at home. I’m sure I’ll think of more to say, but for now, it’s late, I’m tired and I just want to get this posted for those who have been eager to know. Thanks for reading and caring! 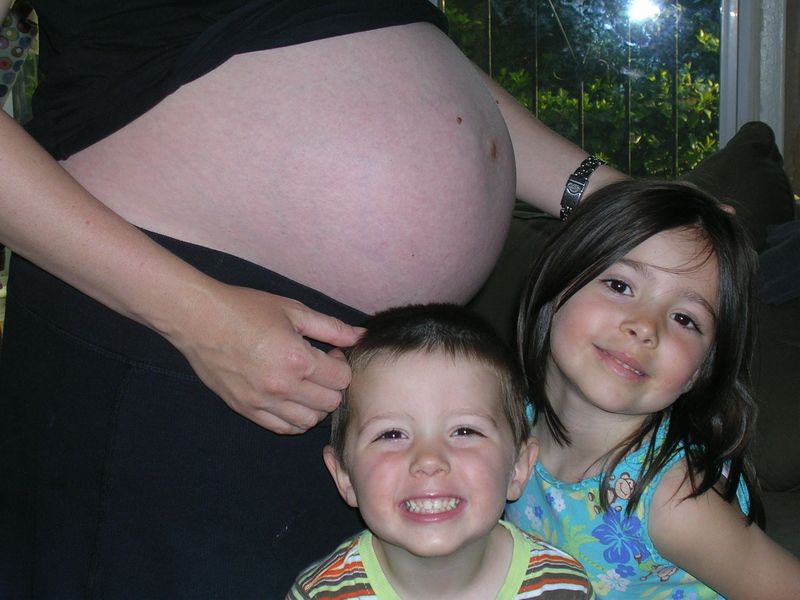 What do you think about the homebirth experience? This entry was posted in Love Those Kids by Shesourceful. Bookmark the permalink.